Drawing with Code: Works from the Anne and Michael Spalter Collection is a computer-generated art exhibition at the deCordova Sculpture Park and Museum in early 2011. Pieces date from 1952 to 2007 and draw on twentieth century visual art inspiration, bold color juxtaposition, strong visual composition, and shapes speaking for themselves and largely devoid of cultural reference, social implication, or conceptual angle. Many artists in the exhibit identify collectively as “Algorists”, artists whose work is based on mathematical algorithms. All the works in this exhibit were produced using computer programs. George Fifield, the curator of the exhibit, begins the journey with a counterpoint of curvaceous oscilloscope works by Ben F. Laposky against a plotted-line fugue of squares by Vera Molnar. 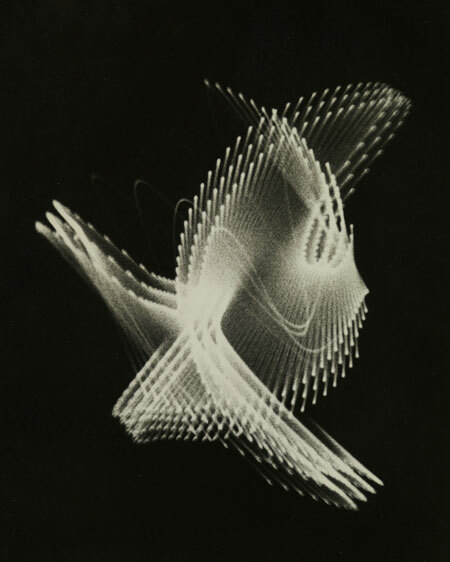 Laposky’s stills caught a dancer-like figure in mid-gesture with the markedly un-artistic device of the oscilloscope while Molnar’s orderly black squares devolved into a cacophony of orange polygons similar to an ancient Chinese horizontal scroll art technique to achieve a time-based, film-like effect. Both achieved a strong sense of motion with a still image. Impossible to overlook in this exhibition is the missing “hand of the artist”. Since this exhibit deliberately includes works that required actual programming of a computer to produce, the sense that a human being produced the marks on these pages is diminished if not absent. Pre-Impressionist painting largely sought to avoid any obvious signs of the artist’s brushstrokes and the consistency of the image was paramount. In the past one hundred years, however, visible evidence of the painter’s presence became desirable, oft described as “painterly”. In spite of this former trend, a new trend is upon us: humans, machines, and our output are gradually becoming unified. Successful content in any medium now depends entirely upon the blurring of flesh and metal, axioms firing in tandem with the CPU, our eyes enhanced by RGB monitors and our appendages mouse-extensible. 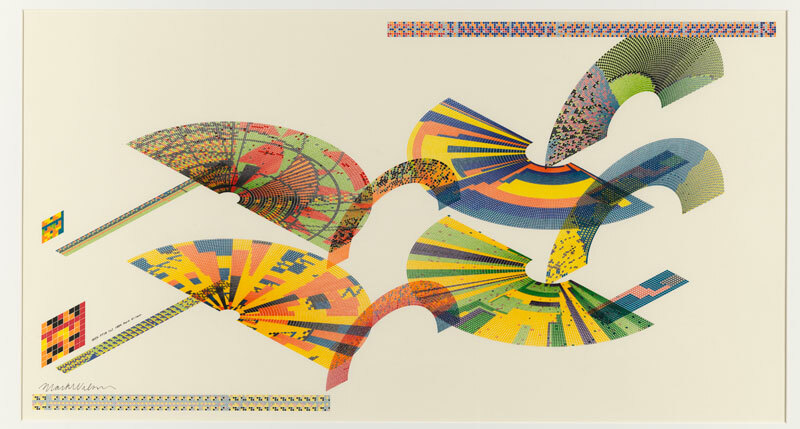 Many of the auto-generated works were subsequently silk-screened, perhaps to lend a “handmade” quality to the works? If that was the intent, it worked at least as well than ever it did for Warhol, the “rehumanization” of factory-machined artwork. A reflection of this more contemporary trend, the “hand of the artist” in this exhibition takes on a different form: the mark of the machine. Distinctive oscilloscope tracks, inkjet characters, plotter vectors, and both Cartesian and Polar graph structures. These are the marks of computers in the 70’s, 80’s, and decreasingly, the 90’s. As pixel size decreases and pixel count increases, computer graphics technology gallops towards the ideal which will finally fool our retina’s rods and cones into perceiving computer-generated imagery as real. By and large, this exhibit made clear that in this aesthetic reality, the computers unapologetically make the visual rules and our eyes are compelled to obey. Manuel Barbadillo commits to the computer’s mark as a foundational particle in his Untitled, 1972, the entire work rendered from a single ASCII character, the asterisk: *. A handful of these white characters on a brown background form the atomic motif of a curved leaf or wave. This shape is repeated on the points of the compass and between to create a complex mandala reminiscent of an asterisk. This is a stark example of a meme self-replicating naturally into more complex structures and grammars then bloom into elaborate concepts and vocabularies. Marks mature into mediums. 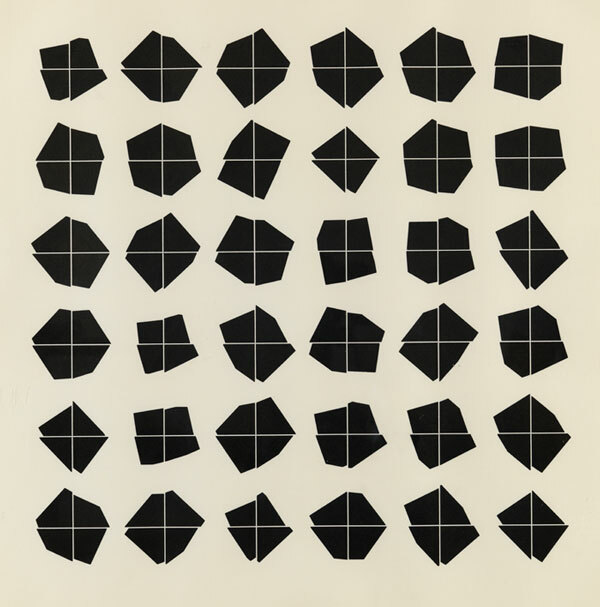 Vera Molnar plots squares and their polygonal kin in keeping with evolution and mutation. Meticulous spacing and shading of square against square, square within square, and the gradual crookeding of the square into asymmetry: almost-but-not-quite-square inside almost-but-not-quite-square. Manfried Mohr examines this grammar, too, with fastidious devotion: the deconstruction of the symmetric polygon into all of it’s asymmetric cousins, using the very tool of symmetric construction to demarcate and plot the demise of shapes: the x-y axis. Mohr’s work springs forth from the xy axis as a fountainhead, an anchor, a home key from which to modulate. While the asymmetry of individual shapes may diverge and compete with one another, their unified bifurcation along the horizontal, the vertical, or both, allows them to share the canvas in harmony. As Darwin showed that life is infinite generative design, so does Mohr examines imaginary variations of life with his own flavor of generative mutation: flower petals as yet unbloomed, hard-edged leaves, branches, and trees in a curveless, Euclidean greenhouse. From the black and white beginnings of Mohr, Desmond Paul Henry, and Edward Zajec, the colorists in this exhibition bloom with all the tenacity and unity of the Fauves. 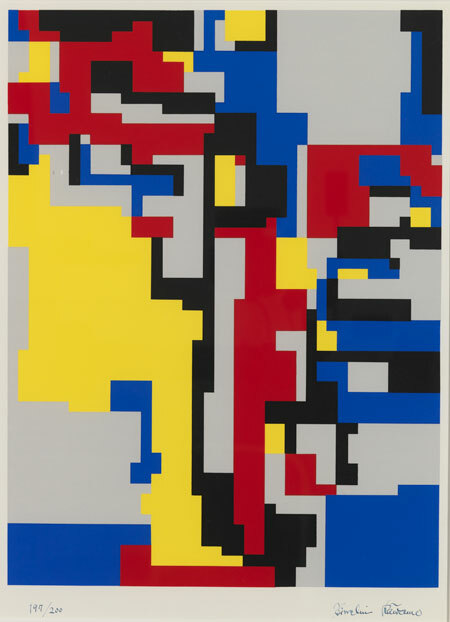 Silkscreen technique affords the bold, low-resolution primaries of Hiroshi Kawano’s Untitled, 1972, the bright oranges and and reds of George Nees Untitled, 1972, and the layered primaries in Frieder Nake’s Untitled, 1972. Increasingly subtle and complex use of color unfolds throughout the exhibition. Wireframes, the grid that graphical computers splay across every surface, enable a machine’s sense of form . The addition of the Z axis brought computers into the human visual realm of three dimensions. Evenly spaced contour lines are the elastic rulers of the digital age, measuring form and space with mathematical precision. By removing the x-axis, Sture Johannessen, in Untitled, 1979, isolate the Y and Z axis, the entire work is rendered with a single, unbroken line, tracing the Braille-like surface of a single, rounded text character, the section symbol: §. The wireframe appears at least once in all but one room of the show. Sven Hoglund and Bror Wikstorm’s cube-like solid faces a broken, meandering strip a half-inch wide in the diptych Untitled, 1979. Jean-Pierre Hebert soothes us with unmechanically delicate black, white, and sandy-hued spirals of shallow wireframe topography in a series of three untitled plotter works . (1995, 1997, 2001) Desmond Paul Henry reveals the only “hand of the artist” in the entire exhibit, embellishing a collection of interlaid wireframes in Androbulus, 1962 with black and white ink hand-applied in long, painterly daubs. This crude effect is nonetheless arresting and engaging against the wireframe foundation, as gauche can electrify charcoal, or a wash reinforces ink. Again we experience the effects of the rehumanization of computer-generated material. Rehumanization is a common technique across mediums and disciplines utilizing computer-generated content. Composers for film and television know that the addition of a single natural instrument performed by a human being can enliven and transform an entire artificial orchestra. Symmetry and parallel lines are distinctive marks of a machine. Though plotter drawings can lend a sense of the human hand to a work, since a mechanical hand of sorts grips a real ink-bearing pen, and the vector lines are nuanced enough to generate smooth curves, plotter precision and tireless repetition evoke, too, the weaver’s mechanical loom. Verostko’s Untitled, 2006, depicts a pink draped woven cloth with prominent yellow fringe. Close inspection belies that the folds are not random but the result of a single line motif repeated over and over with slight variations and sizes. Every thread of the work bears some relationship to this single curvy-lined motif, a visual woven canon. Using a similar motivic approach, the artist’s second work in the exhibit, Untitled, 1990, could also have been created with threads, not woven but bunched, crumpled, and splayed in heaps and gnarled lumps. This is the only symmetrical work in the exhibit, but the predictability stops there. This bright, furry, Rorschach vision propels this exhibit into the surreal. Tektronix 4663 plotter using pigmented inks and an IBM PC, 43.125 x 27 in. Mark Wilson brings this exhibition into resounding final cadences with large, masterful tapestries of color, composition, and space. Wilson steers us into the third dimension with a firm hand. Though the elements in these works are still distinctly two dimensional, their angles and curvatures carve spaces deep into the canvas. The atomic characters form molecules of geometric shapes, circles, polygons, and their subdivisions. In SKEW FF10, 1984, physical references to compact discs could just as easily be stadium diagrams or hard drive partitions. The general sense of smaller things filling larger things is undeniable. Composed entirely of typeset font-based characters, the mark of the machine is nowhere more apparent than in Mark Wilson’s work. 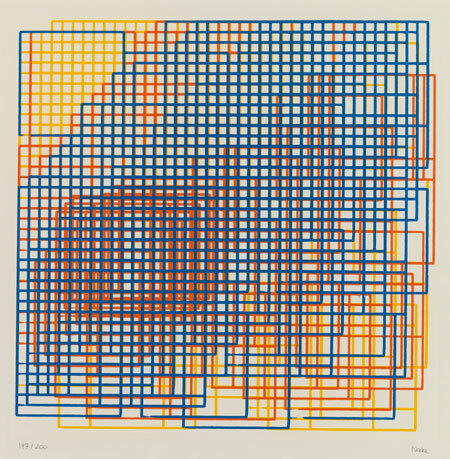 A counterpoint to Molnar’s scroll-like study of squares in three colors, Structures de quadrilateres, 1986, Wilson’s study of circles, P9232, 2007, displays added layers of compositional consideration in a banquet of shapes and color. Less measured in material, treatment, and negative space than classically-inspired artists such as Mohr or Nake, Wilson embodies the modern Baroque, spoiling us with candy-wrapper-colored sprays of cloisonné, mosaic, or stained glass. Décor fit for a digital Duomo. The evolution of the “hand of the artist” and the adoption and acceptance of the “mark of the machine” is an ancient theme. Major technological advances cause the obsolescence of older technologies or manual techniques: Hand-written books gave way to the printing press. Hand-mixed oil paints vanished in lieu of factory-produced pigments sold in a tube. Stage performances evolved into live television and radio, then into recordings. The list is long. Proponents and stakeholders of the old method naturally resist the change until resistance is futile or is quelled naturally by the passing on of vested parties. Younger generations adopt new ideas and technologies more easily than the old guard, sometimes too easily, which is why the counterbalance of elder wisdom is important. Flying machines are an excellent example of a technology that failed to deliver on it’s promise for a long, long time, sending many visionaries and their machines plummeting to their deaths. Technology-inspired artists, curators, academics, teachers, and collectors also play this delicate game of trying to fly towards the sun without succumbing to aesthetic peril. 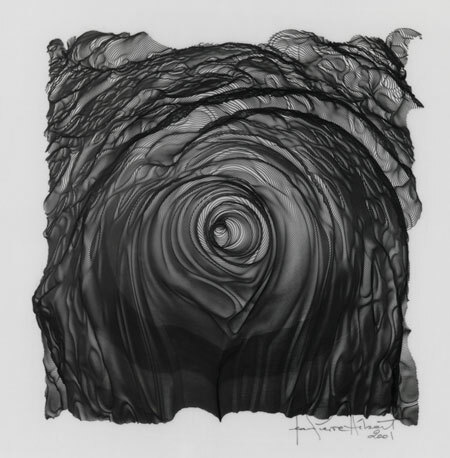 This exhibit of works from the Anne and Michael Spalter Collection documents a dizzying ascent. Curated for deCordova by George Fifield, Director of Boston Cyberarts, Inc.
Dan Hermes is an audiovisual artist, consultant, curator, and writer. His art reviews are published in journals such as Media-N, the online journal of the New Media Caucus, and the Computer Music Journal, MIT Press. More info at www.danhermesfineart.com. In the spirit of full disclosure, Mr. Hermes’ work is included in the Anne and Michael Spalter Collection, though his work does not appear in this particular exhibition of the collection. Images used with permission from the deCordova Sculpture Park and Museum. >Much thanks, Michael. Good to see you at the Cyberarts opening.